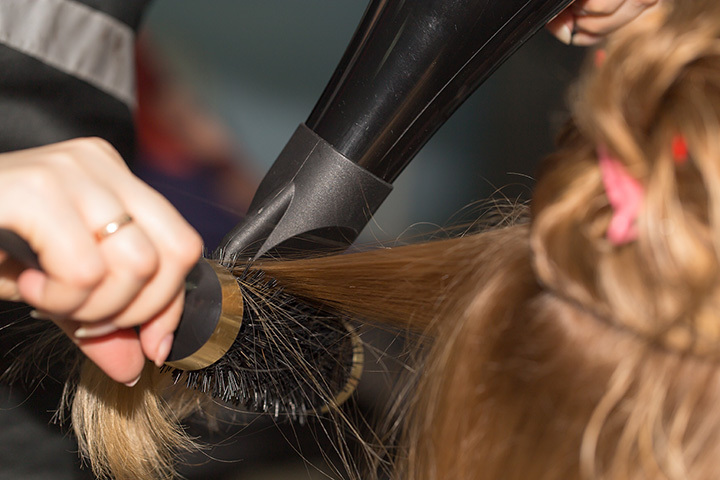 Whether you’re in need of a quick trim to freshen up your look or you’ve got a big event planned like prom or a wedding, Connecticut’s hair salons are prepared to make you feel your best. From cuts and colors to blowouts and extensions, find just what you’re looking for at the 10 best hair salons in Connecticut! The Hair Color Company offers haircuts, styling, coloring, conditioning, glaze, highlights, keratin treatments, and keratin blowouts. Pricing starts at $57 for a regular women’s cut and $35 for men’s. They also have waxing options, which include areas like eyebrows, chin, lip, full leg, and bikini. You can call or book an appointment online. Fringe Hair Works is a luxury hair salon located in a historic old library. Their expert stylists deliver personalized service, and you can enjoy a latte or glass of wine as you wait for your appointment. Hair services include women’s cuts (starting at $55 for an Associate Stylist), color starting at $65 for a re-touch or $85 for full, hair extensions, keratin treatments, and styling. Men’s services are also available. Jo Bruno Hair is a full-service salon and curl specialist. Through their knowledge and love of textured hair, they’re able to offer you an artistic hair experience. Cuts start at $15 for young kids (or if you want bangs or a trim) and $40 for adults. Jo Bruno also offers coloring, styling, and waxing options, as well as eight different types of treatments. Envy Hair Salon believes your needs are what’s most important. Their expert stylists are committed to giving you the best service in the industry, and they’re experienced in caring for a wide variety of hair types—whether coarse or fine, straight or curly. Cuts start at $20 for kids and $31 for adults. Regis Salon in Manchester is located at The Pavillions and is a perfect spot to get your hair done while you’re out doing daily errands. They offer a variety of services, including all-over color, highlights, trend color techniques, waxing, deep conditioning treatments, and specialty services. Serenity Hair Salon is an appointment only location, but starting in January they will have Walk-in Wednesdays. There is a mandatory deposit for new clients, unless you manage to snag a walk-in appointment and then the deposit will be waived. Their services include cuts and styles starting at $50, updos, shampoo, wig installation, relaxer treatments, and more. Salon Nathaniel offers clients an inviting atmosphere for their appointments. The salon provides innovative hair styling options, like keratin treatments, color, extensions, and waxing. Haircuts at Salon Nathaniel start at $23 for both women and men, and the price increases depending on the type of cut and style you want. Beard and bang trimming options are also available. Part of the North Haven community for more than 50 years, the Terrace is committed to providing its customers a positive experience. Since its earliest days in 1964, the Terrace has been on the forefront of innovation with its unique approach to styling and cuts. Today, the tradition carries on, along with an always-welcoming atmosphere and expert services ranging from formal updos to deep conditioning treatments. Next time you need to freshen up your look, stop into the Terrace. Jules Salon’s artistic stylists are focused on giving you a cut that reflects your personality and pairs perfectly with your face shape. Whether you want something edgy or precise, they’ll take the time to make sure the look is something you’ll love. Haircuts start at $45 for a regular stylist and go up to $60 for those who want an appointment with a master stylist. Main Switch Beauty Salon has experience working with all kinds of hair types and textures, and they specialize in bi-racial and curly hair styles. Their full-service salon provides you with a warm and friendly atmosphere. Main Switch’s cuts start at $35, with an additional $40 cost for those interesting in getting it styled. Dolce Hair Salon has a special on Tuesdays, Wednesdays, and Thursdays where you can save $30 on keratin smoothing treatments. Dolce’s stylists can do men’s cuts starting at $19 and women’s cuts starting at $21. Full color options start at $42 for a re-touch, and basic perm will run you around $55.